The picture above is the stairs going down to other food stalls at Ili-Likha. This alone gives the feeling of going down some imaginary fairy tale-like place ala-Alice in Wonderland if you will. 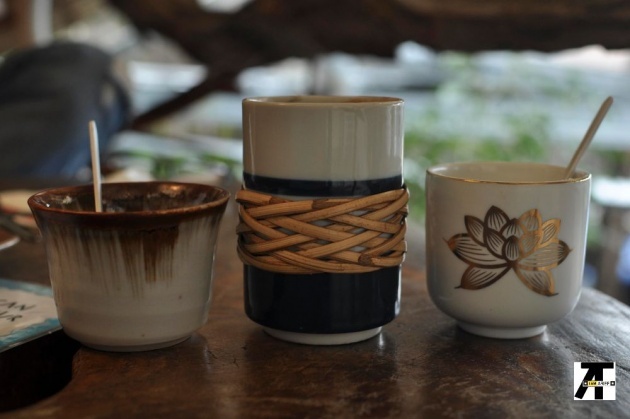 Upon entering Ili-Likha, there is already a vibe of artistry and creativity. 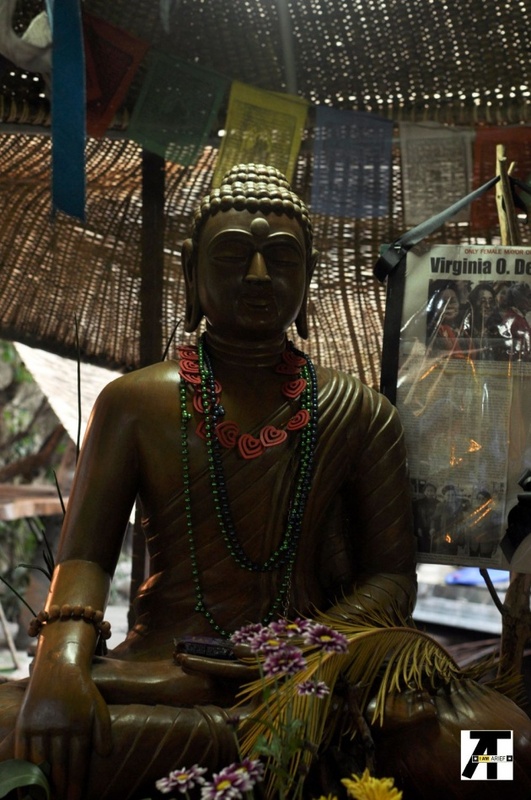 Ili-Likha is truly an artists' village where expression of art can be seen all around. Eric de Guia (Kidlat Tahimik) established this place along Assumption Road, Baguio City. 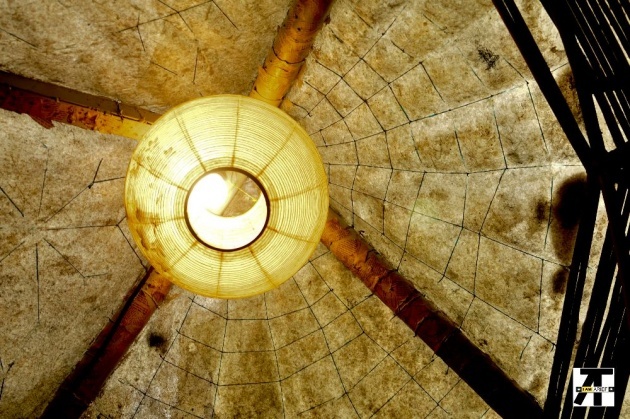 There is eccentricity, artistry, creativity everywhere corner, every nook, everywhere you turn. Your eyes and mind will be amazed and awe-struck with how much imagery the mind can come up with and the ideas are endless. My eyes were still swimming with delight of colors and images. They also turned this place into house of different food stalls. Every space was maximized to give businesses enough area. There are a lot of stalls to choose from. We decided to try Balay Amani. 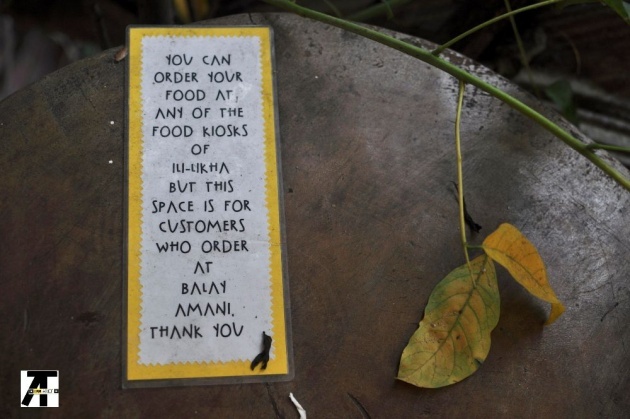 Balay Amani is the the stall located at the far end on the left when you enter Ili-Likha. Signs are put up in different areas that each stall has, claiming their space and reserving that for their customers. 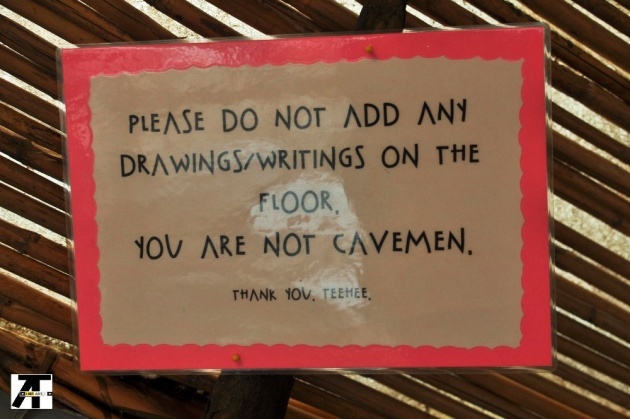 Because of the small space provided for each business, one must know their space limit. Here at Balay Amani there are already lots of things to picture. We decided to rest our butts on their upper floor/mezzanine area. 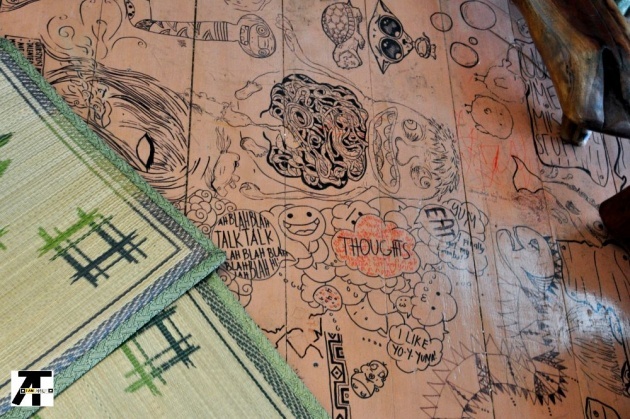 The wooden floor has writings and drawings. They turned it into a freedom floor of some sort. However, one must respect the artistry the owner put on that. The place is not meant for vandalism or conquering by writing "I WAS HERE" or other insouciant uncaring teenage attitude you have. 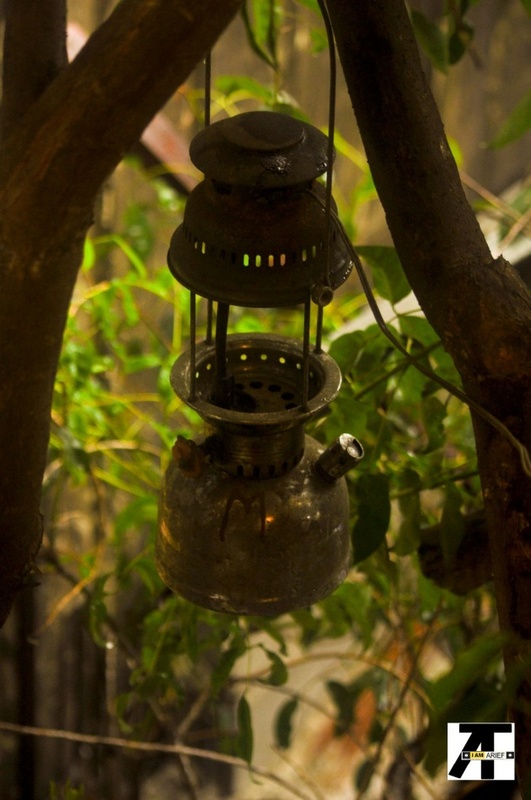 This is a place to dine and enjoy your food and the ingenuity around you. Here is where you fulfill your stomach's desires. Leave your artistic nature in your mind. Because the space is a bit cramped, it is better and wiser to sit on the floor. 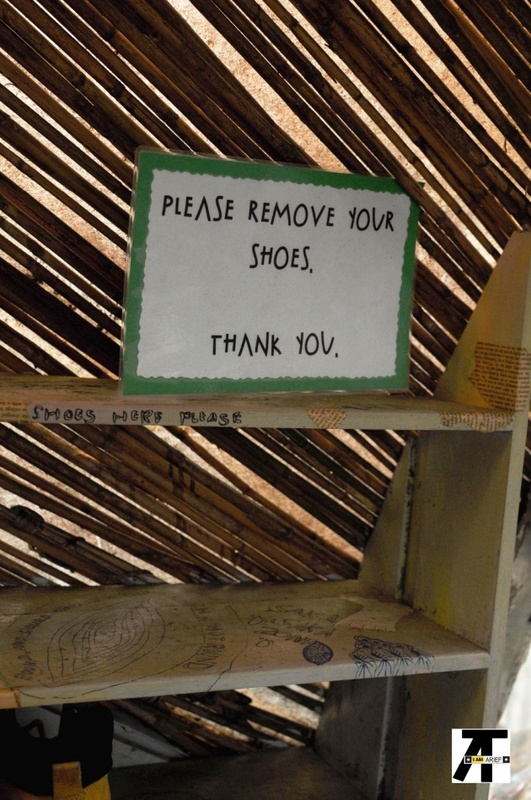 Thus it is a must that you remove your shoes. This gives a homey feeling, making you more comfortable. 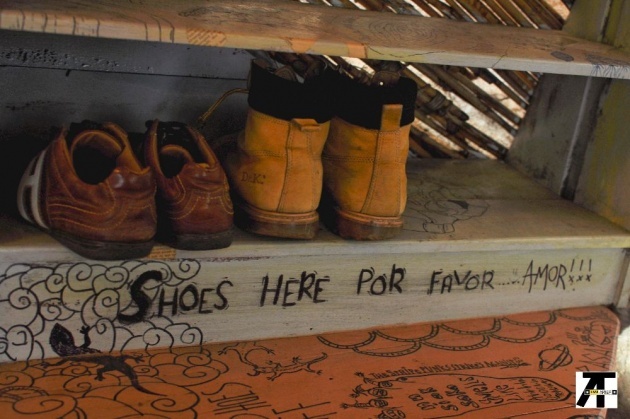 A shoe rack is provided for you where you can place your shoes neatly. "Saka" means feet. "Saka-saka" means barefoot. 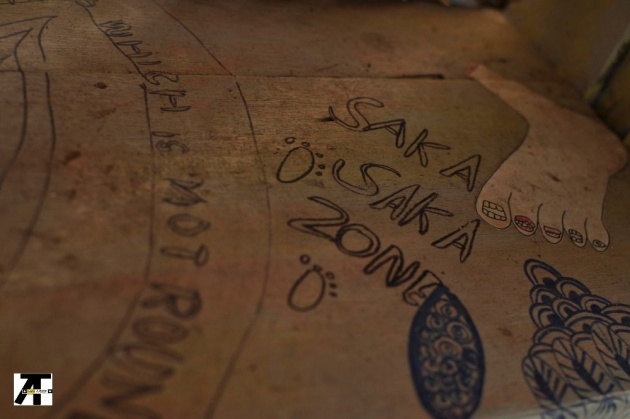 Thus, "saka-saka zone" means no shoes allowed. You can keep your socks on though and sit Indian style or lie down if you will as long as there are no other customers besides you. From floor to ceiling to wall to tables and chairs, everything is filled with interest. The roof is made of plastic GI sheets. 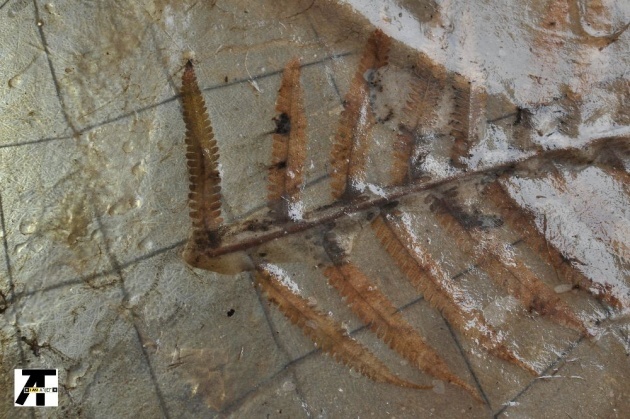 The GI sheets are melded with dried fern leaves - a plant that is abundant in the Cordilleras. This gives it an indigenous look. 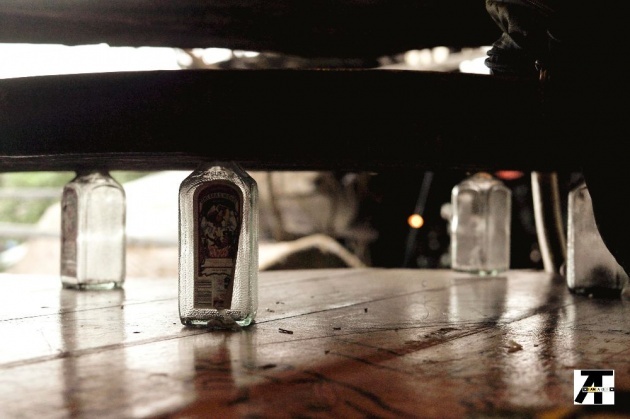 They even used used empty bottles of gin as legs for the tables. 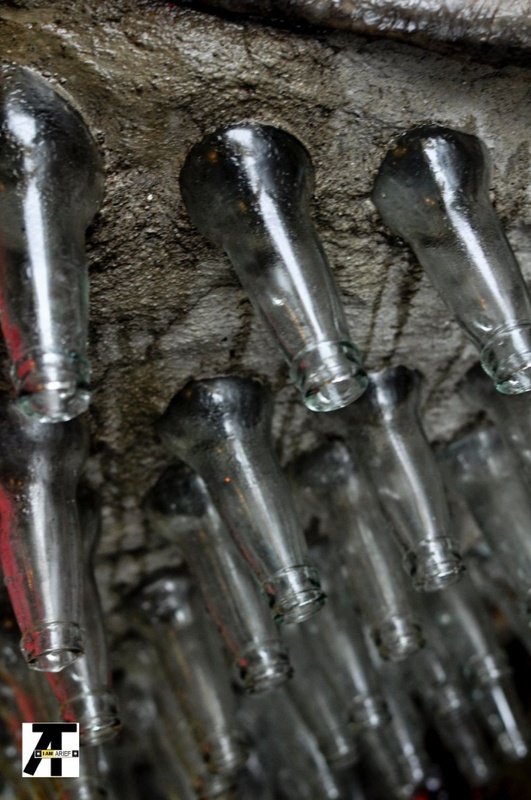 That is a nice idea to use your empty bottles. 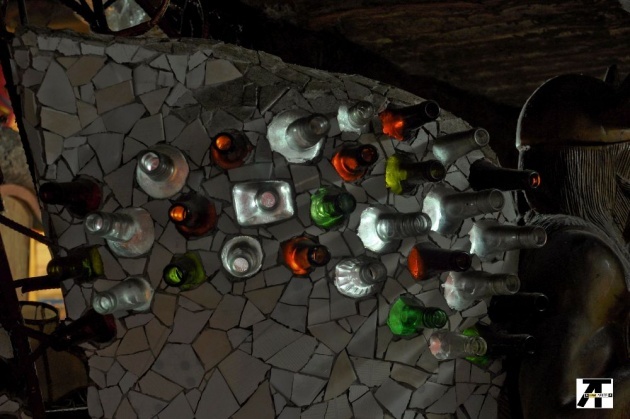 Another artistic way to use your empty bottles is to place them on walls to serve as mosaic of some sort. 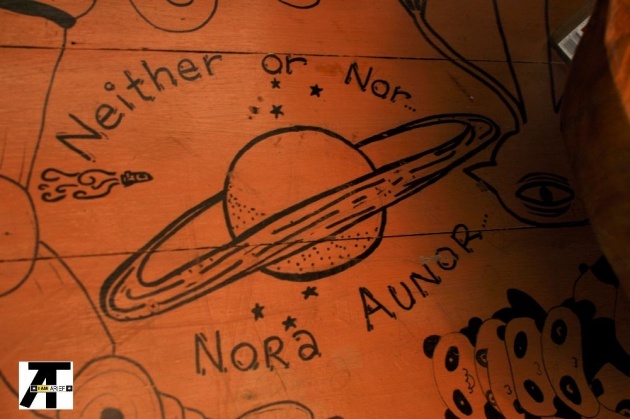 This picture is a drawing in one of the tables at Balay Amani. 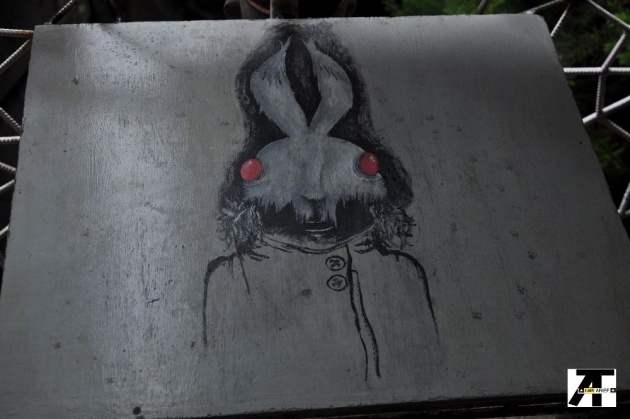 This made me think of Donnie Darko. This is a repetitive style noticeable at Ili-Likha. 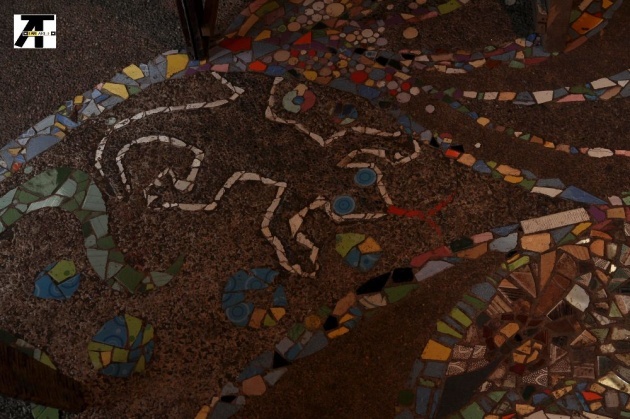 This is the tile mosaic of the ground floor at Balay Amani. Most of the floors at Ili-Likha has tile mosaic. The toilet for boys is also tile-mosaiced. 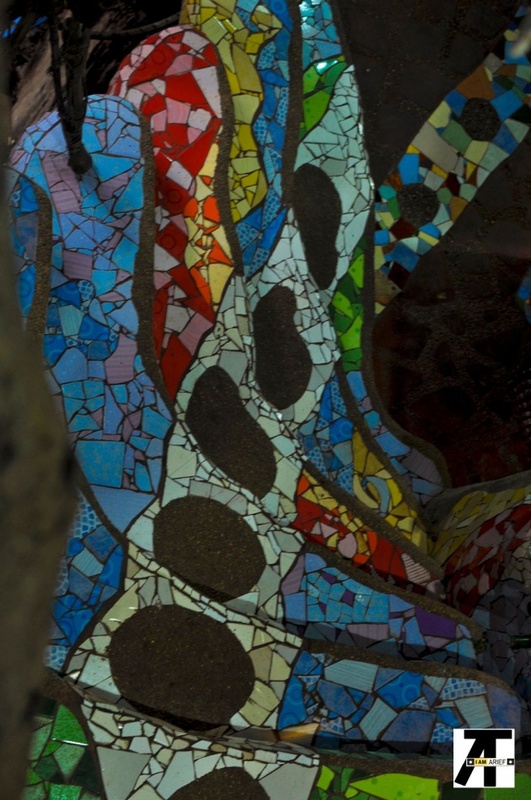 Note that some parts of the sidewalk at Session Road is also tile-mosaiced. 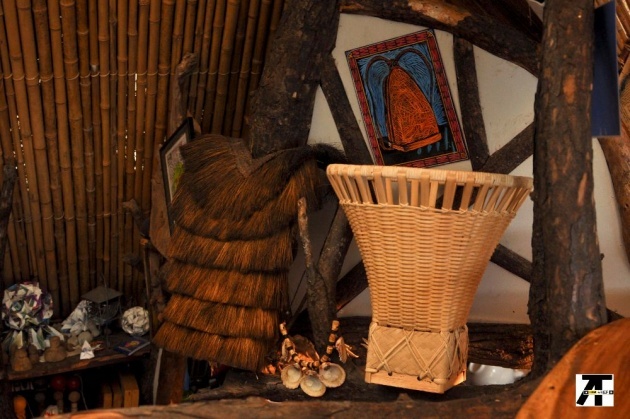 The picture above is a display at Balay Amani. The basket is called "kayabang" and it's made of bamboo and rattan. The vest-like garment to the left is a hunter's backpack called "bango" or "pasiking." The hair like portion of is designed for waterproofing. 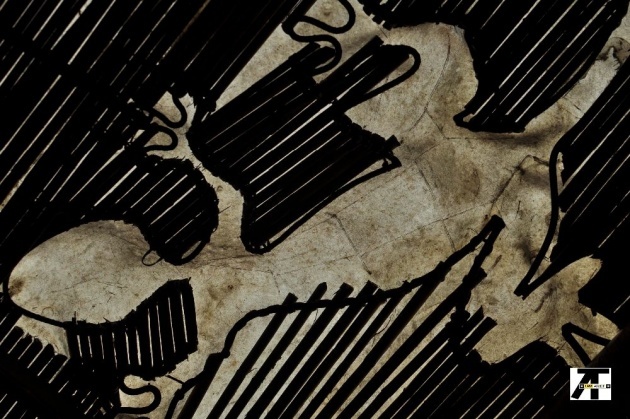 It could either be made of dried leaves or fur. 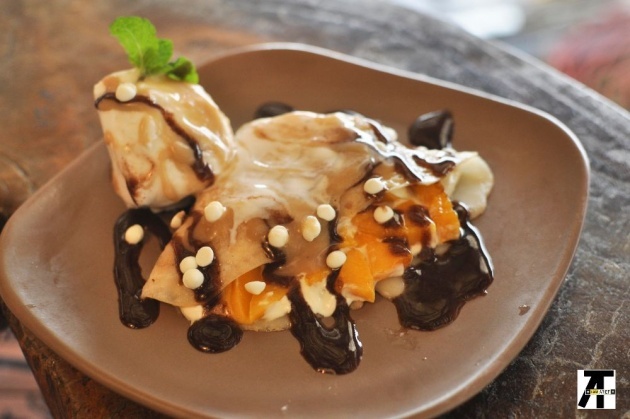 For something to fill our palates, we tried their mango crepe and coffee. While the food and drinks may not be something extraordinary, it's a good way to start the Ili-Likha experience. There are other food stalls there that we can try and be adventurous of the next time we visit the place. The place is not yet fully developed. There are still lots of spaces that needs to be filled and construction is still on the way. 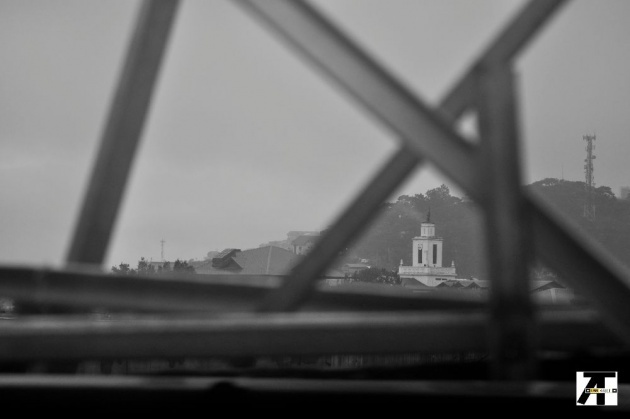 From where we were seated, you can see the tower of Baguio City Hall framed by the steel beams at Ili-Likha and the tower of a radio station at Camp Allen. This may not be same view if the place is finished. 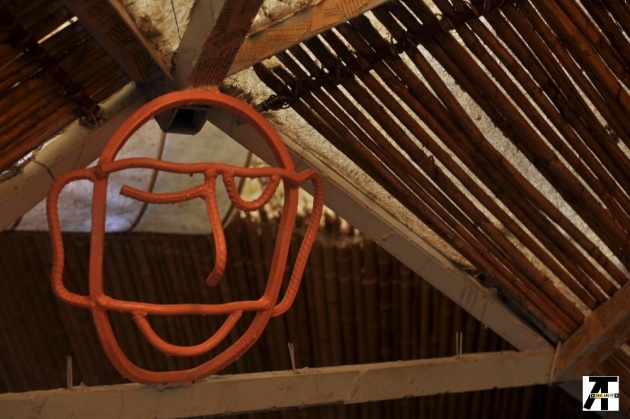 Pay a visit to Ili-Likha Artists Village when you are around town and see for yourself the artistry in putting up this place. Wahh.. it's cool.. I like it so much. I'm a fan of your writing.. can't wait to read other interesting topic! di pa rin ako nakapunta dito daan na nga lang ako ng daan ng assumption hahaha. Filipino talent at its best. Wow! 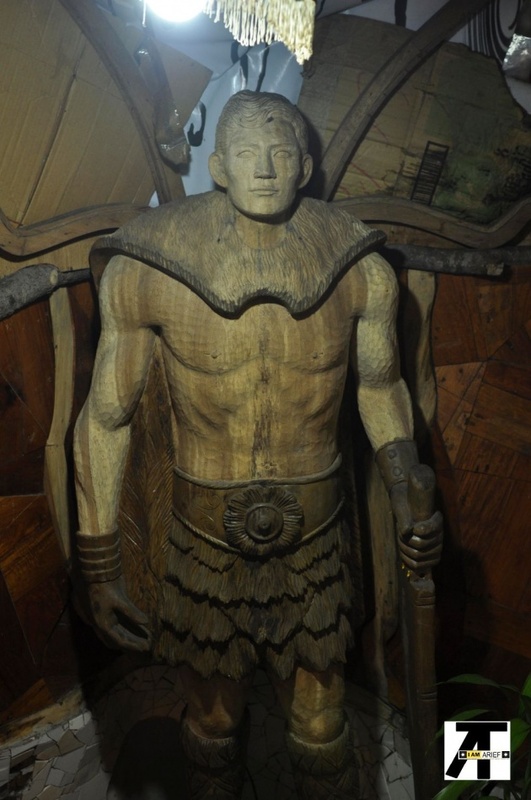 I want to see personally that carved Jose Rizal with a warrioe-like costume! Wow Incredible Art Here, Great Post!! I want to go there, too! Forth time to visit this blog hehehe. sub and buzz back me! Awesome journey to an artistic village. You have done nicely and congrats for the 5 star. Subscribed and buzzed, pls subscribe and buzz back. Anyone who buzz and subscribe me will be buzzed and subscribed back. When you read this comment.I maximum buzz For you.Today.Please 1 buzz me back.TKs.. I will continue to buzz you . pero makaka earn ka parin kahit na esubmit for review? pag gumawa ng blog, kelangan be pindutin yung submit for review? padaan ulit ang ganda nung rizal na machete hehhehe. Brother give me a solution please, how to increase buzz like you? very impressive designs. Though using empty bottles as table supports - isn't there a risk some idiots will break the glass? I like the idea of using a gin as stand for the chair. I have a lot of those here in the house due to nightly drinking sessions. Nice. Haven’t heard of this place before. Hope to visit this someday. wow!sana nlaman ko tong place nato wen we visited Baguio. sa Baguio to noh? hello brother tell me the tirck for fast bitcion earnning . This shows the genuine artistry of the people here in the locality. It only proves that there are lot of talented Filipino artists.